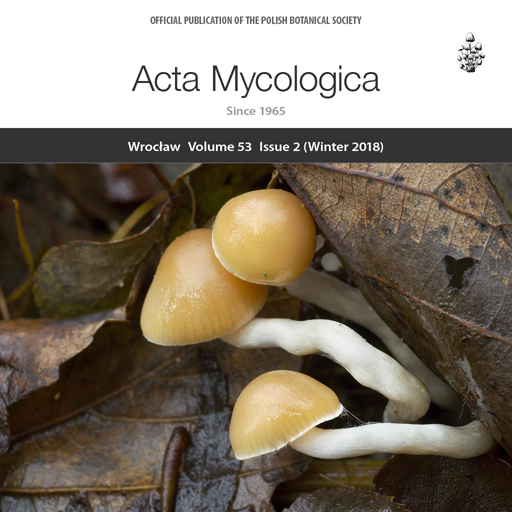 The international journal Acta Mycologica is published by the Polish Botanical Society, with financial assistance of the Polish Ministry of Science and Higher Education. The journal promotes all aspects of mycology and lichenology since 1965. The journal offers Open Access publication of original research papers, short communications ,and reviews dedicated to all disciplines of fungal science including taxonomy, distribution, genetics, fungal structure, physiology, evolution, ecology and mycocoenology. The list of scientists who have served as reviewers for the Acta Mycologica journal in the year 2018. The editors express their great appreciation of all reviewers competence, dedication, and hard work. Dear Readers. We continue to provide subsequent archival issues of Acta Mycologica journal. The digitization of archival issues is conducted with the support of the Polish Ministry of Science and Higher Education. Starting from the jubilee 50th volume, the Acta Mycologica will be only available as an online edition. Therefore, the page numbers are no longer used for citation purposes. Every article will now contain citation schema with the unique article number included, which replaces pagination. In the following example the article number is 1063: Acta Mycol. 2015;50(1):1063. Additionally, the article number is the last part of the updated DOI pattern, e.g., the following DOI is assigned to the article number 1061: 10.5586/am.1061. On the cover In Poland, Psilocybe serbica M. M. Moser & E. Horak var. bohemica (Šebek) Borovička, Oborník & Noordel. has hitherto been found only in the vicinity of Lubawka village. It is also known from the Czech Republic (locus classicus near Brno) and perhaps also from Austria. Psilocybe serbica var. bohemica is very rare, the total number of known localities in Europe is less than 30. Moreover, many localities of this fungus have been damaged by the “magic mushroom hunters”, because it is known for high concentration of psychotropic tryptamine-like alkaloids.